Heat the cream, milk, half of the sugar, and the salt in a saucepan over medium-high heat until the mixture barely reaches a simmer, then reduce the heat to medium. Meanwhile, whisk the egg yolks with the remaining sugar in a separate bowl, until light. When the cream mixture is hot, temper the eggs by whisking 1 cup of the hot liquid into the egg yolks, then add the tempered egg yolk mixture to the rest of the hot cream mixture in the saucepan. Chill completely before adding the vanilla, then churning the ice cream according to your ice cream maker's instructions. 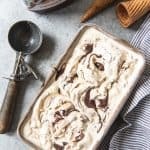 Add the Nutella in the last 30 seconds of churning by dropping dollops of Nutella at a time into the ice cream so that it can be pulled through and stretched into ribbons. If this isn't working, stop the machine and use a butter knife to swirl the Nutella into the ice cream in thin ribbons.